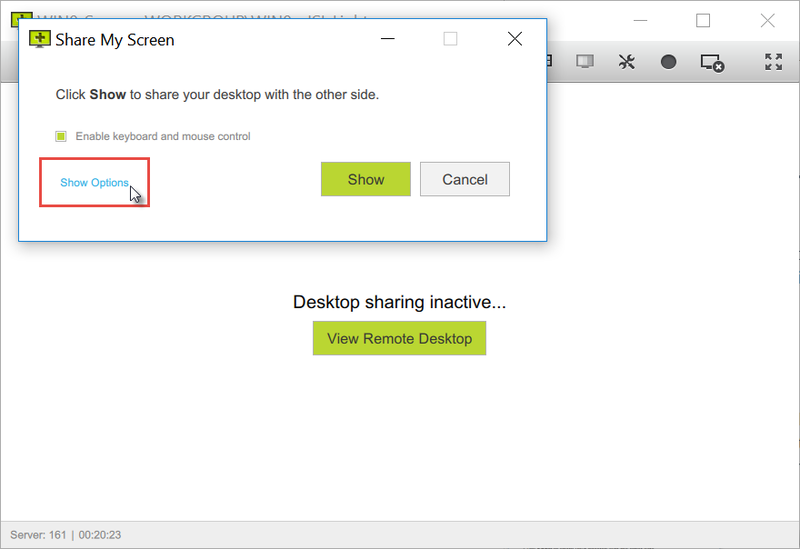 Click "View Remote Desktop" item from desktop sharing drop down to view remote desktop. Note: If you are connected to your own computer then viewing your own screen will cause it to be displayed as a nested image withing itself. You will be prompted to confirm this action. 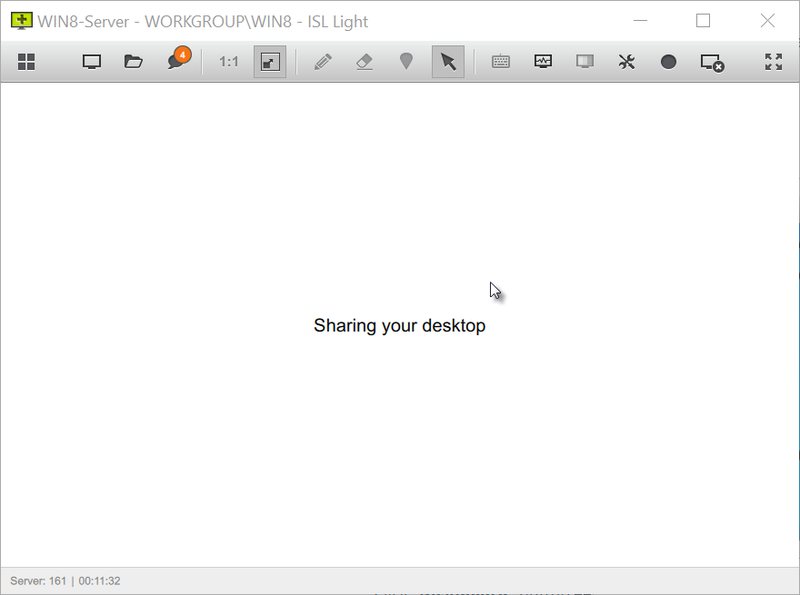 Click "Share My Screen" item from desktop sharing drop down to share your screen. 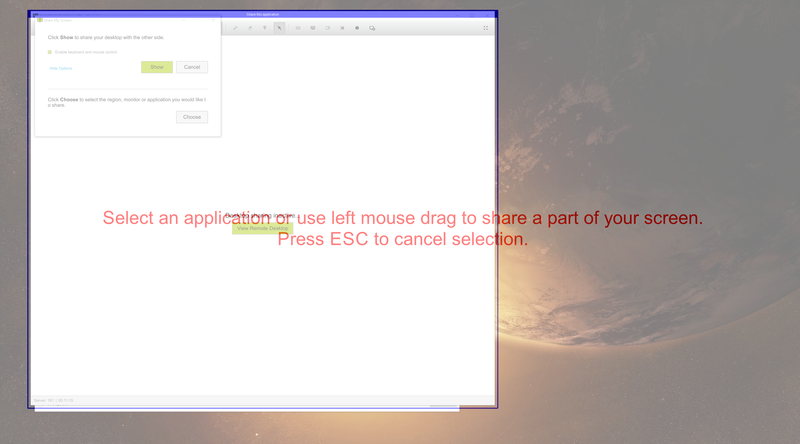 You can also share only one monitor, application or particular region of your screen. Note: this feature is available from ISL Light version 4.3.2. 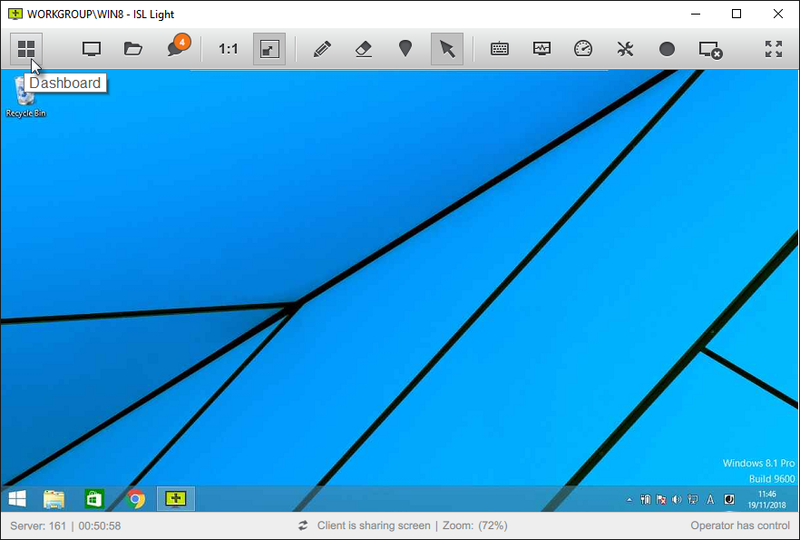 By clicking on Share My Screen you will get a dialog. By clicking on Show button, you will share your entire screen. 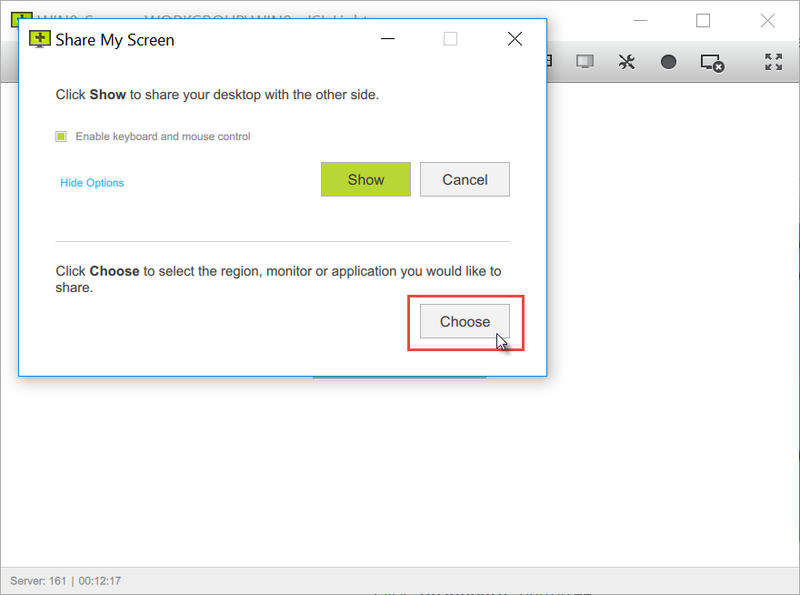 In order to share only a particular monitor, application or screen region, click on More Options. Select the screen region, application or monitor you wish to share with your client. 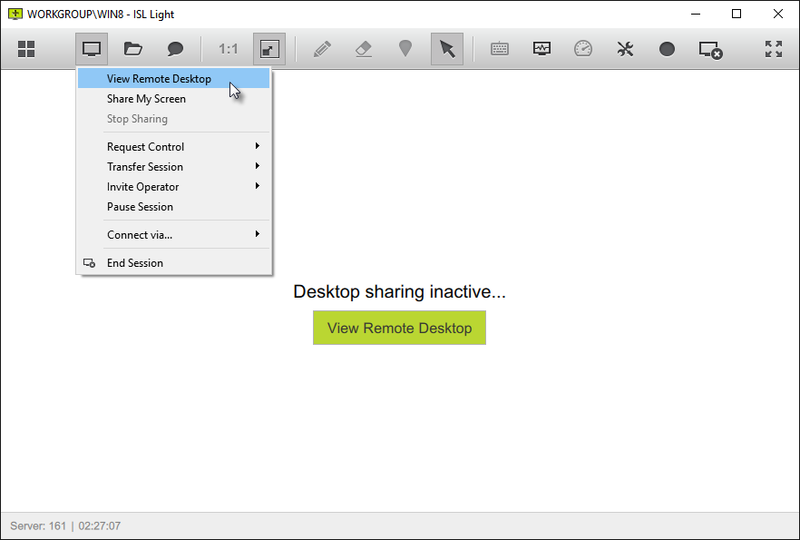 To stop desktop sharing, press on the "Stop Sharing" in Desktop Sharing dropdown menu. By default "Request Control" is disabled. The client needs to revoke control to disable mouse and keyboard to operator. 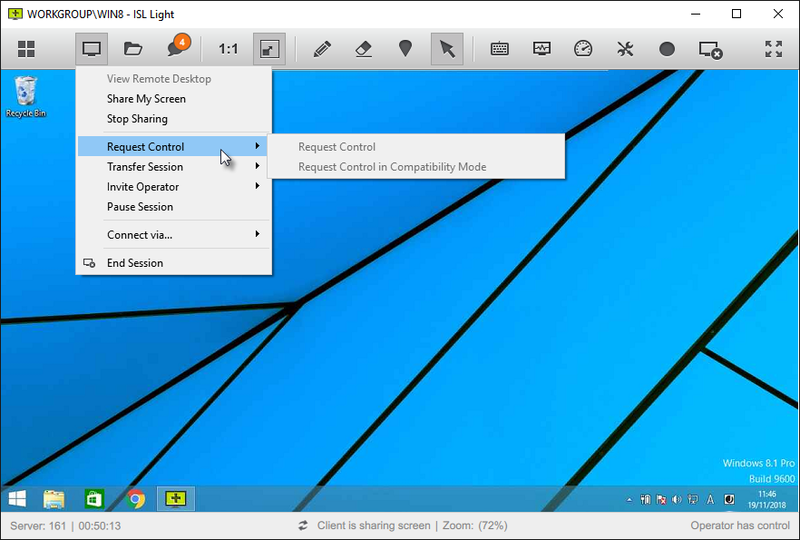 Then operator can request control. Go to "Transfer Session" option under "Screen Sharing", from there you can select how to send a transfer link to another supporter. 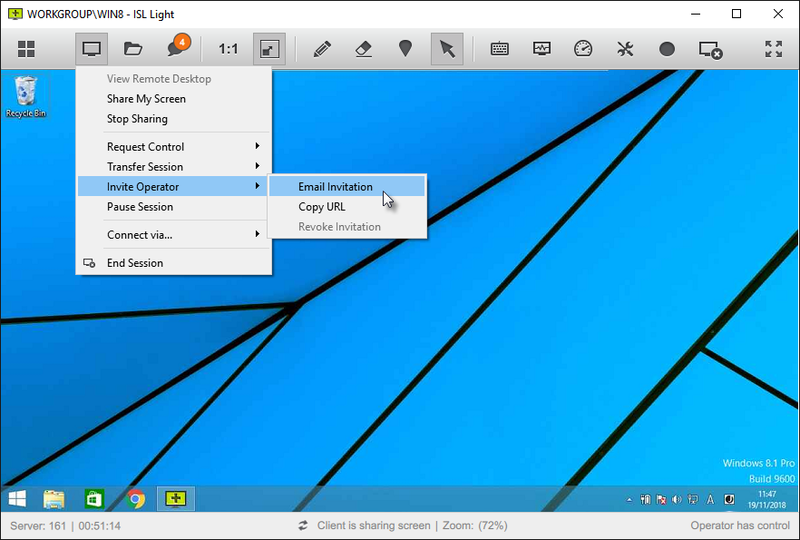 If email option is selected, you can edit the body of the email and input the recipient. 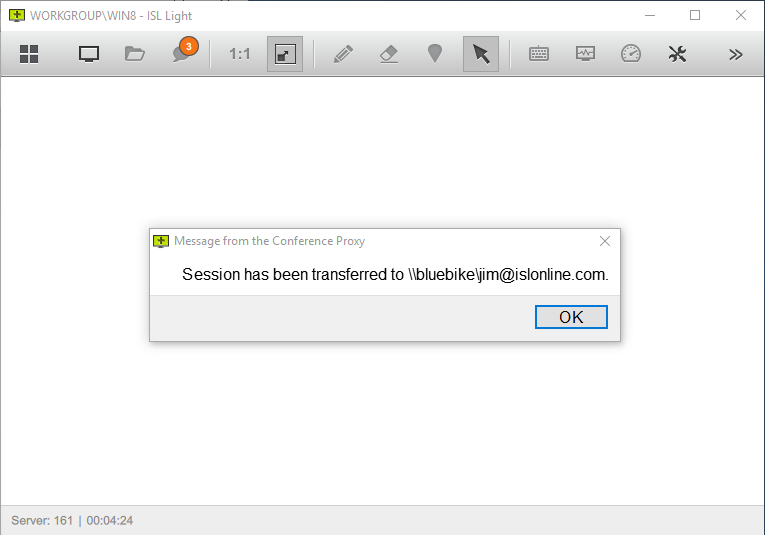 A message will appear notifying you that the session has been transferred. 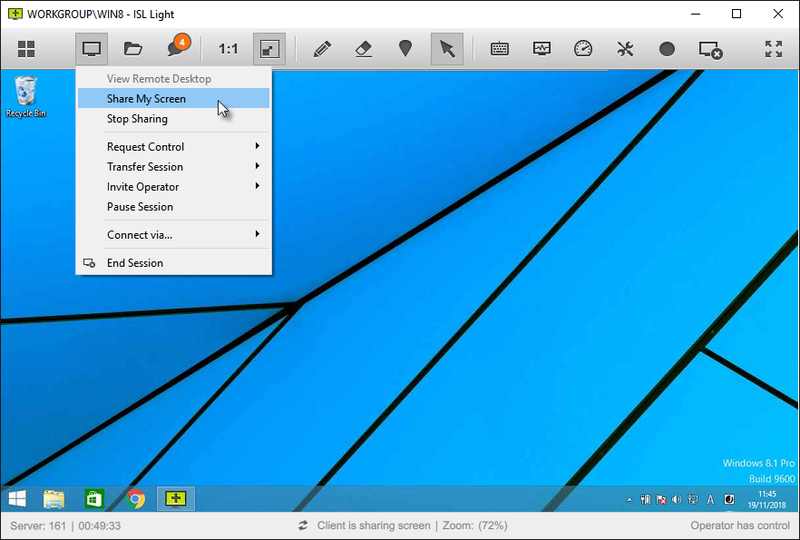 Click "Dashboard" button in the left corner of ISL View Window. Click on "Transfer Session" button in the Action menu for your current session. You will be prompted to enter an email of supporter to whom you wish to transfer the ongoing session. Once they click on the link, they will take over the session and you will be disconnected from it. If you need additional help when supporting a customer, you can invite another supporter into the session and you can help the client together . Unlike the Transfer Session option you will not be disconnected once another operator joins, rather you will both be able to see and control the remote computer. 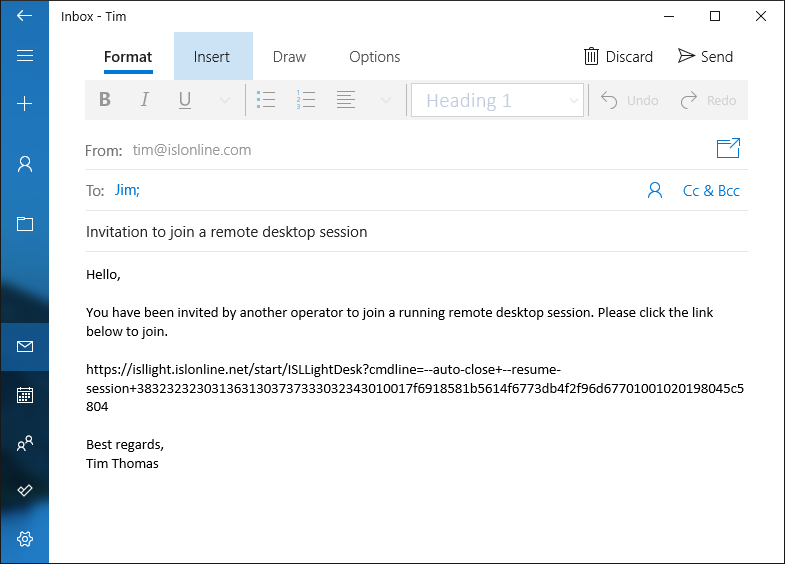 Note: Invite operator functionality is disabled if you are connected to a computer viaISL AlwaysOn. 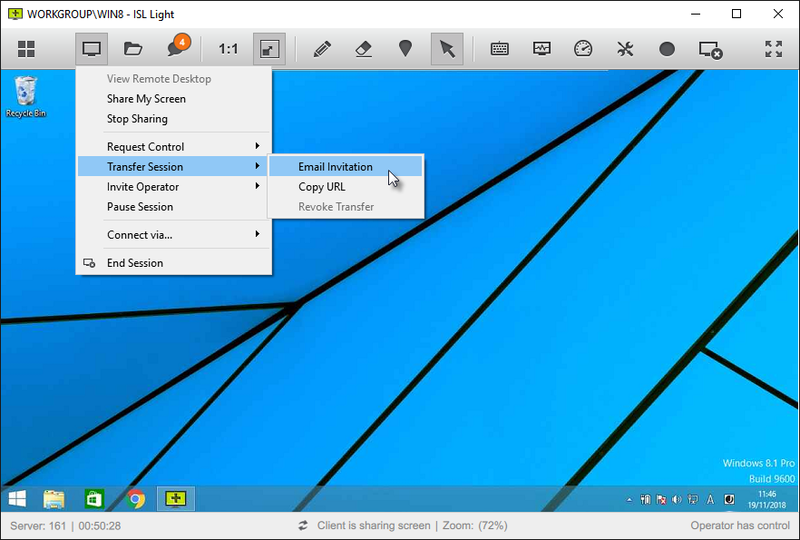 Click on "Invite Operator" and select the "Email invitation" option. Send the email containing the invitation link to another supporter. Once they click the link they will join the session and you can help the client together. 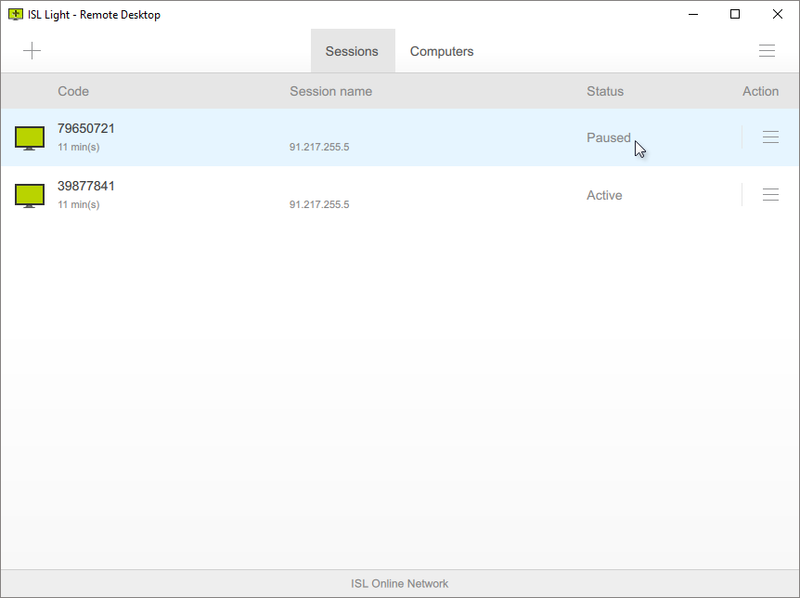 Click "Pause Session" in Desktop Sharing drop down. Click the paused session to resume session. 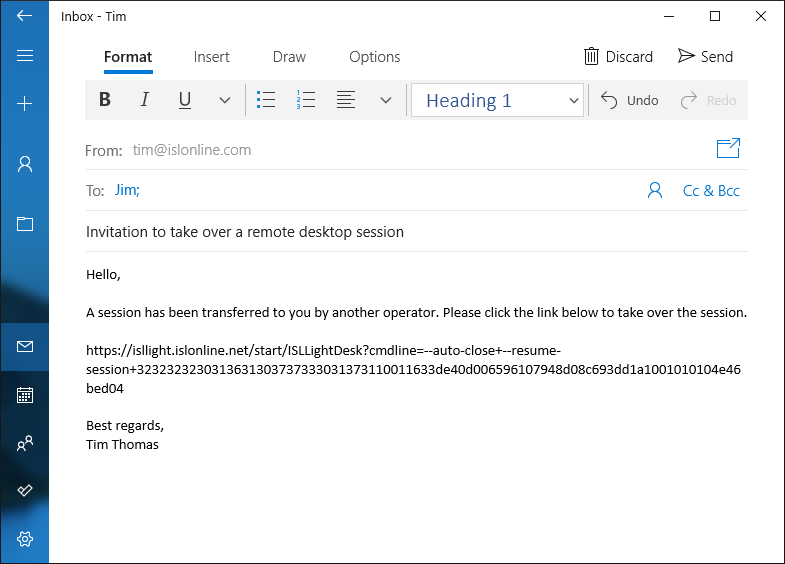 Click "Yes" to resume session. 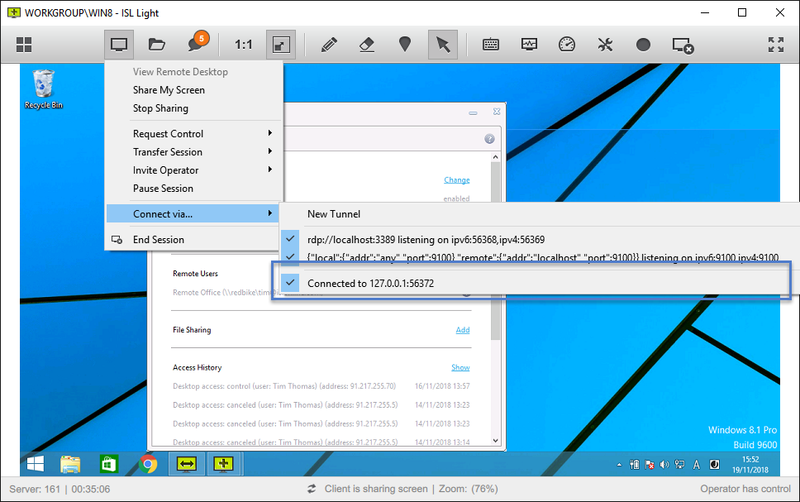 Click on "New Tunnel" to create a new tunneled connection. Middle list shows the active listeners (ones that have a blue checkmark) that are listening for new connections. When a listener detects a connection it will spawn a tunnel. Click on a specific listener to disable it. Bottom list shows the active tunnels ()ones that have a blue checkmark), that are currently in use. Click on a specific tunnel to close it. 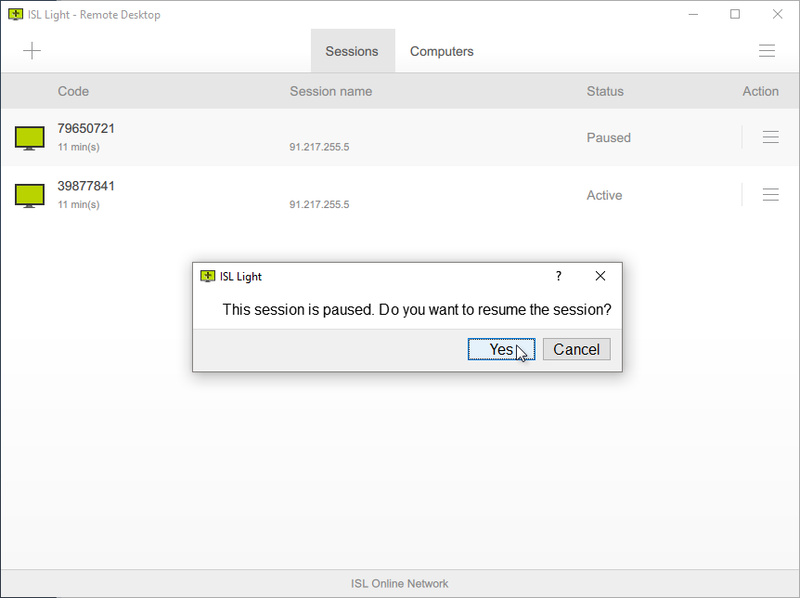 Click "End Session" to end current session.